One of the things I love about where I live is my close proximity to a whole bunch of bookstores. There’s a new one opening this week, even, and it’s on my way home from work! The convenience is incredible. One of the bookstores also happens to have a Twitter account and they post when they get new stuff in. One day last spring they posted – right before payday! – that they’d just received a whole bunch of used cookbooks, some of them classics. I was there the next day, before they’d even finished sorting through the stacks. There were the usual things, the Jamie Olivers and the Ina Gartens and the Nigellas, and some interesting things, like a Jacques Pepin book on healthy cooking from 1994 (which I happened to already have for some reason) and a few westcoast- and Pacific Northwest-specific books I wanted but not enough to pay the asking price for. And then I found a book on Hungarian cooking, which I don’t know all that much about, and it was beautiful and kind of funny. 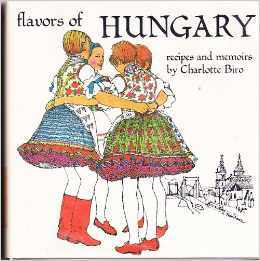 It’s called Flavors of Hungary: Recipes and Memoirs and it’s by Charlotte Biro. I bought it before the clerk at the bookstore could figure out how much it was really worth. “15?” he said, and I snapped it up right there. Buy it for the recipes, love it for the memoir bits. Biro started out as the daughter of a wealthy family and the wife of a high-ranking official with the Credit Bank in Hungary; her life was shattered by war – her home was bombed by the Germans and she lost everything but her family cookbook. She was imprisoned with her husband while trying to escape the country in 1949 after the country fell to communism, and finally emigrated to the US where she joined her brother and daughters in 1957. Flavors of Hungary: Recipes and Memoirs pulls together those family recipes she saved during the war, brought with her to prison, and then took with her when she moved to America. This soup is named after the famous Hungarian actor, Ujhazi. It was his favourite. One of the most famous coffee houses in Budapest – called “New York” – specializes in catering to the after-theater crowd. From midnight until morning, they serve hangover soup, chicken broth, and pork and beans. The elegant setting of the restaurant is the meeting place for all the prominent people in art, music, literature, and the theater. Brown bacon in a Dutch oven or heavy 3-quart pot (with a lid) over medium-high heat. Remove the bacon from the pot, but leave the fat. Reduce the heat to medium and brown an onion slowly, until it is golden and translucent. Add paprika, water and ham hock(s) to the pot. Simmer for 90 minutes or until the meat is tender. Remove the hocks from the liquid. If there is meat remaining on the bones, pick it off and set it aside. Add the tomato, green pepper, and sauerkraut and cook for an additional 20 minutes. In a small bowl, stir together the flour and sour cream. When thoroughly combined, add this to the soup with the sausage and any meat reserved from the hocks. Taste, adjusting seasonings to taste. Serve hot, with additional sour cream on the side. Thanks for writing this lovely review of my grandmother’s cookbook! The book means a lot to my family and me, and I’m glad that people are still discovering it. It’s wonderful to hear from you, Raul – I love your grandmother’s book and am so happy to share it! Flavors of Hungary is my “go to” cookbook. I have been using it, for the wonderful easy recipes, for about 50 years. My personal cookbook has fallen apart and will try to order a replacement copy on line.